All Natural Hair Loss Products For Men And Women. The color difference in the above photos are due to lighting and using a phone camera. However we attest they are the same person. Most Forms of hair loss, alopecia, or thinning hair in men and women are considered reversible by the scientific community. Reversible because 95% of the time the cause of hair loss, alopecia, or thinning hair in men and women is due to a disruption in the hair growth cycle from the over production of the hormone DHT in the sebaceous glands attached to the hair follicle. This over-production of DHT inhibits the ability of your hair follicle to absorb enough nutrients to create long, healthy hair. Over time this results in balding or thinning areas that appear and start spreading on the scalp. You are constantly growing and losing hair all over your body. However, to have a healthy head of hair, you need to keep growing more hair than you lose on your scalp. When you start producing too much of the hormone DHT in the area around the hair follicle, you either start losing a little more hair than you're growing in that area or the hair already growing there gradually becomes so miniaturized that visible patterns of balding, alopecia, or thinning hair result. Our research indicates the cause of this over-production of the hormone DHT (dihydrotestosterone) is a genetic defect in metabolizing very long chain fatty acids from the linoleic (omega 6) and linolenic (omega 3) essential fatty acids. The sterols from these longer chain essential fatty acids are what become metabolized into your hormones. A defect in this delicate system can create an over-production or under-production of certain hormones. In the case of hair loss, too much DHT is produced. This excess interferes with the hair follicle's ability to absorb nutrients. You then start growing shorter and shorter hair until it is so miniaturized that the naked eye cannot see it without the aid of mechanical magnification. Hormone changes occur as men and women age, these changes are part of a natural process. Nevertheless, no one likes the visible effect of these hormone changes when you start experiencing excessive hair loss. So what can you do? Up until now about the only thing you could do that might work was to use drugs like minoxidil or finesteride (both have side effects) or you could explore hair transplants (which are expensive initially and even more expensive over time as pricey out-patient visits may be required to replace failed transplants or address continued hair loss). You could also try a natural solution - certain herbs do have some effect as natural DHT inhibitors like saw palmetto and others or you could take certain vitamins, use LED (light) therapy, rinse your hair with things like apple cider vinegar, or use coal tar shampoos, and many other natural options. Our experience with these options is they don't produce good results. However, we don't discourage their use since the majority are relatively safe, and perhaps you will see some benefit. HGE™ Hair Growth Extract™ like most great discoveries was more accidental than intentional. Our breakthrough came when we did an oil extraction on a combination of rare heirloom Italian vegetable seeds that contained unique fatty acid complex structures that we decided to test for effects on hair loss. We mixed these fatty acid sterol complexes with natural DHT blockers and natural hair growth stimulators and incorporated them into our proprietary liposome delivery system-that delivers these powerful hair growth nutrients deeply into the scalp and saturates the hair follicles. 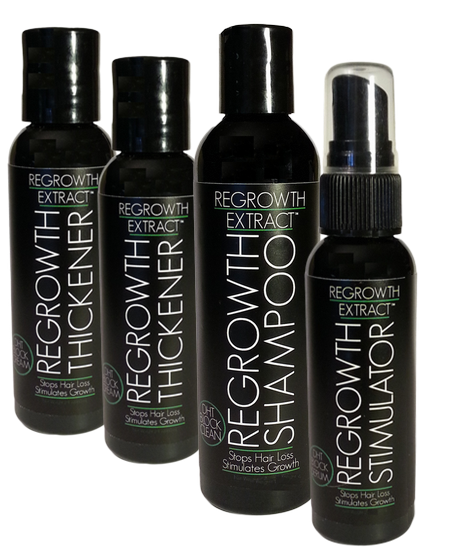 The initial tests were promising, and pilot studies showed HGE™ Hair Growth Extract™ to be more effective than any other product or system we are aware of. Hair thickness increased even in late stage balding. Excessive Hair loss stopped or normalized in a short period of time (in some cases as little as a few days). Scalp issues including dandruff and itchy scalp improved some after just one application. Hair thickness, strength, and body improved within an average time of 1 week. Average time for evident hair thickening around the edges of the balding-thinning areas was 30 days. Each Product Used Individually Will Produce Results. 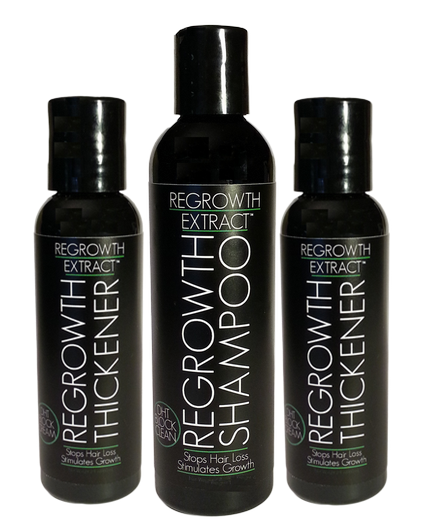 However The HGE™ Hair Growth Extract 3 Step Treatment System™ Which Includes The Hair Growth Leave-In Conditioner, Hair Follicle Stimulator and Organic Anti-Oxidant Shampoo Produces The Best Results . You Can buy Them Individually Or You Can Save Money When You Buy Them In The Following Combo Offers. Comments: For early stage balding you can use once a day. For late stage balding we recommend using twice a day AM and PM. Safe for colored hair and all hair types (oily, normal, and dry). You can use this product even if you are not experiencing hair loss. It will strengthen and give body to limp or fine hair and help prevent any future hair thinning. It Infuses The Scalp and Hair With Unique Long and Very Long Chain Essential Fatty Acids Extracted by us and Helps Balance The Over-Production Of DHT. Instructions: Normal Use is after shampooing and towel drying your hair. However Shampooing is not required. Place a small amount in the palm of one hand. With the other hand, dab product with fingers and use finger tips to work the cream into your scalp. Start with the balding or thinning areas first, then spread outward over the entire hair and scalp. If any product is left on the palm, rub remainder between both palms and massage into the hair and scalp. Comb or brush your hair to remove any tangles, and then dry as usual. Your hair should immediately have more body and fullness, allowing you to reduce or eliminate the use of toxic sprays, mousses, or gels. Play around with the amount, if you have fine thin hair you will only need a very small amount or it may create a little heaviness if you use to much. For late stage balding we recommend application 2 times a day, in the morning and before bed (shampooing is not required for application). Before going to bed is the most important application, if you only use once a day make sure it is before you go to bed also take the time to massage into your scalp, it only works below the surface not on top. Ingredients: organic virgin olive oil, HGE™ Hair Growth Extract™ (long and very long chain essential fatty acid sterol complexes extracted from rare Italian heirloom vegetable seeds ), proprietary blend of bio-extracted sunflower, false daisy, rutaceae pilocarpus, Bladderwrack, grapeseed, red clover, beeswax, horseradish, quaking aspen tree bark, bio-extracted peppermint. Comments: This shampoo is the highest lathering shampoo ever developed without using chemicals. The anti-oxidants used in this shampoo are very potent. They are mainly derived from tea leaves aged 15 years, organic pomegranates and organic apples. This shampoo looks more like a deep rich burgundy wine because of the exceptionally high concentration of polyphenols. It repairs damaged cells while removing the toxic buildup from the hair and scalp. It's thoroughly nourishing and deeply cleansing. Safe for colored hair and all hair types (oily, normal and dry). Helps eliminate dry, inflamed, itchy scalp, and dandruff. We recommend using only this shampoo while using the Hair Growth Leave-In Conditioner and Hair Follicle Stimulator. Instructions: wet hair and pour a generous amount in the palm of your hand. Apply to wet scalp and lather. If you have longer hair you can repeat. Lather and allow to sit on scalp for 1-2 minutes before rinsing. Product is nourishing for face and skin-safe to rinse off hair and allow over face and skin. Provides added stimulation to the hair follicle for faster hair thickening. Instantly adds thickness and body to your hair. Shortens the time involved in visible hair thickening. On its own it will provide a natural stimulation to the hair follicle. 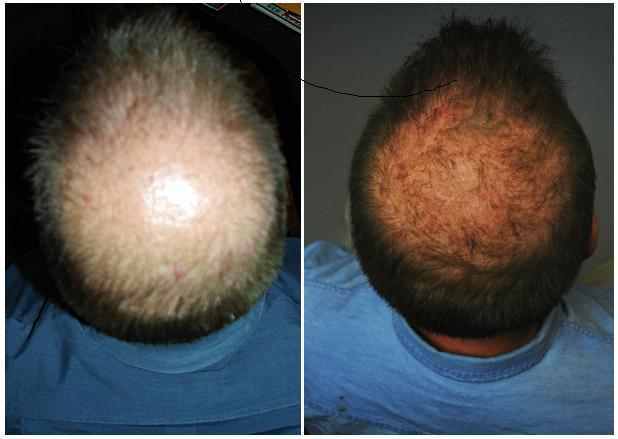 For some with mild thinning hair just using the Hair Follicle Stimulator with the shampoo can produce great results. However for those with more advanced thinning hair issues adding this product with the Organic Anti Oxidant Shampoo and Hair Growth Leave-In Conditioner will greatly enhance their effects. Directions: When using with the Hair Growth Leave-In Conditioner simply mist after application and comb or brush. If just using with the Organic Anti-Oxidant Shampoo mist after towel drying and then brush and style as usual. Can also be used anytime to add more body and fullness to hair, just mist and comb or brush. Ingredients: Fermented Organic vegetable protein and berry extract, fresh spring water, Phospholipids, proprietary blend of bio-extracted sunflower, false daisy, rutaceae pilocarpus, Bladderwrack, grapeseed, red clover, beeswax, horseradish, quaking aspen tree bark, bio-extracted peppermint. Special Combo Offer with Hair Follicle Stimulator. Buy the Hair Growth Leave-In Conditioner with Organic Anti-Oxidant Shampoo and Get. Q. What Causes Hair Loss? More than 95 percent of all hair loss in men and women is due to a condition known as androgenic alopecia, or male pattern baldness. This happens when DHT is produced in high quantities by the 5-alpha-reductase enzyme found in the scalp. The binding of DHT to the genetically predisposed hair follicle results in lower nutrient uptake and gradual suppression and miniaturization of the hair and eventual shrinkage and deterioration of the hair follicle. Q. What is Hair Loss Extracts and how do they work? Hair Loss Extracts are made with only natural active ingredients that have been scientifically proven to be the most potent anti-DHT compounds available today. Hair Loss Extracts work by blocking DHT in the scalp-decreasing the levels of the hormone available and naturally stimulating the hair follicle to stay or start the anagen-growth phase. This allows the hair follicles to rejuvenate and produce thicker and stronger hair. Q. Does Hair Growth Extracts Products work for women? Yes, we have about half women and half men as satisfied customers. In most cases the cause of hair loss in women is basically the same as in men. There are some minor differences, in women estrogen helps to protect the hair follicle from the destructive effects of DHT. However, when estrogen levels decrease and DHT production increase women can develop thinning hair. Hair Growth Extracts work the same in women as in men to protect the hair follicle from DHT. After one to 3 weeks of use, you will see a significant decrease in hair loss and notice that your hair is thicker, stronger and much healthier also scalp issues will improve like dandruff and itchiness. After three to four months of use, continued thickening becomes more visible and keeps increasing with continued use. Q. Does Hair Loss Extracts have any side effects? None we are aware of when used as directed. Hair Growth Extracts active ingredients are made of all natural compounds and have a long history of use both orally and topically. However, some people may experience a little redness in areas of extreme baldness-that can indicate hair follicle stimulation and usually visible hair growth in those areas becomes evident about 30 days after the redness. If any redness or itchiness persists discontinue use and we always recommend a skin test on the inner forearm before use to check for any allergic reactions. Q. Does Hair Growth Extracts work on other ethnic hair types like African American hair? It works for all ethnicities. Q. How is Hair Growth Extracts used? Shampoo your hair with the Anti Oxidant Organic Shampoo, daily or every other day, apply a small amount of the Hair Growth Leave-In Conditioner after shampooing and a larger amount before bed massaged into the scalp and then mist the Hair Follicle Stimulator on top of the conditioner. Also you can mist the Stimulator several more times during the day and just let it settle into the scalp for extra stimulation. Q. Do I need to keep using Hair Growth Extracts Products. After you achieve your desired results, you can cut down on the frequency of use however we recommend you continue them if you want to maintain a healthy head of hair. Q. I am using Rogaine® and/or Propecia®, can I use Hair Growth Extracts Products at the same time? You could however these products produce great results on their own. Q. I recently had hair transplants. Can I use Hair Growth Extracts? Yes. Although the transplanted hair follicle is resistant to the destructive effects of DHT, the surrounding follicles are not, so we recommend using these products after hair transplantation. Q. What are dead-atrophied hair follicles? The effect of unchecked DHT destruction on the follicle over a long period of time can permanently destroy the follicle and cause the follicle to be replaced by scar tissue. Nothing can make a dead follicle produce hair, that is why it is important to start protecting the follicle sooner rather than later.